Click on the links below and explore! 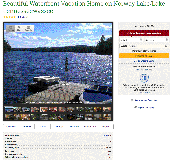 Norway Lake is in the beautiful western Maine hills and is a perfect place to visit or spend your vaction. For a comprehensive calendar of local events events check the Community Calendar form the Oxford Hill Chamber of Commerce http://www.oxfordhillsmaine.com. Email us if you have any suggestions you would like to share. What do you love more - your green lawn or a clean lake? You CAN have both! If you are in the lakes watershed area - please help keep our lakes, ponds and streams clean by using phosphorus-free products! Paris Farmer's Union is stocking No Phos phosphorus-free fertilizer. There is lots of valuable information about what you can do to help keep our lakes clean at the Maine DEP Website. Norway has online boat registration! For those of you like me who always forget to do this at Town Hall - just a few mouse clicks & your credit card and you can renew and print out your boat registration at home (stickers are mailed). Wondering what all those green algae blobs are in the lake this year? The National Weather Service confirmed that an EF-1 tornado with wind speeds between 86 and 110 miles per hour cut a swath through Norway and South Paris continuing on through Buckfield, Sumner and Hartford late on the afternoon of Friday, August 21st, 2009. For more info and pictures click here. Wind Farm in Norway? Click here for full story.